Finding the best tough watch that will fit your wrist so perfectly that you don’t even notice it as you’re wearing it is a tough task that even I have trouble identifying at times. The watch under review here is known as the Alpina Seastrong Diver 300. For those that may not be aware, dive watches are ones that can be worn up to a certain amount of meters under water and are generally water resistant, which can prove useful for a number of reasons. I wore the Alpina Seastrong Diver 300 to test it out and the following is my review of the highlights of the watch, as well as the pros and cons. The Alpina Seastrong Diver has a number of notable highlights that are important when searching for the best tough watch. For instance, the stainless steel frame is quite durable and definitely scratch resistant. The battery life is advertised as being 45 months. While I haven’t worn it nearly that long, the battery has held up so far, which is always a good sign. The overall aesthetic of the watch is really sleek and sophisticated, with the black in the case juxtaposed nicely against the silver of the rest of the watch. The watch itself consists of a one-directional rotating diving bezel, as well as a water resistance of just over 600 ft. The crown and case-back are also screw-in, which allows for easy maintenance. There are really a lot of things I liked about this watch. 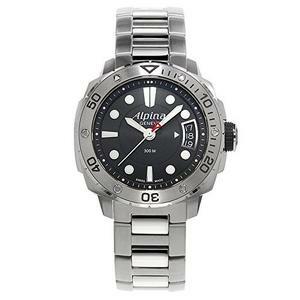 For one, while many dive watches are often somewhat uncomfortable to wear, the design of the Alpina Diver 300, which consists of a stainless steel frame, actually makes it quite comfortable to wear. There are no hard edges and the way the back of the watch rests against the skin is really nice. The stainless steel strap outfitted to the case is nothing amazing, but does the job adequately. While I would have preferred a rubber strap instead, the steel strap is more durable and works wonders for the aesthetic of the watch. The stainless steel composition itself is very durable, which can be quite useful in a number of situations, especially for those that want to take it under water. The bezel located on the side of the watch case is easy to turn and has worked perfectly for me. That being said, there are also some aspects of the watch that I didn’t quite like. While the 600 ft. water resistance is quite useful and is a decent number, there are many watches out there with higher water resistance levels, which are more useful for those that dive at greater depths. This isn’t a huge negative for me, but can be for others. As mentioned previously, I would have also preferred it if the Alpina Diver 300 had come with a rubber strap instead, as I feel as though the watch would have been even more comfortable with that. If they had more variants of the watch, I feel as though it would be all the better for it. These negatives are definitely not deal-breaking for me, but they could prove useful to know for anyone that is searching for the best tough watch on the market. Overall, this watch comes with a wide array of features. That being said, I merely want for this review to provide some help to anyone that reads it. You should weigh the pros and cons and make the decision that is right for you on whether or not to purchase this watch. Tawatec E. O. Diver MK II: A Dive Watch Tough Enough for Tactical Mission Can Seiko Men SKXA35 Automatic Dive Watch be any Good? Freestyle FS85008 Precision 2.0 Classic: A Stylish Entry-level Dive Watch How Good is ArmourLite ISOBrite T100 as a Dive Watch?